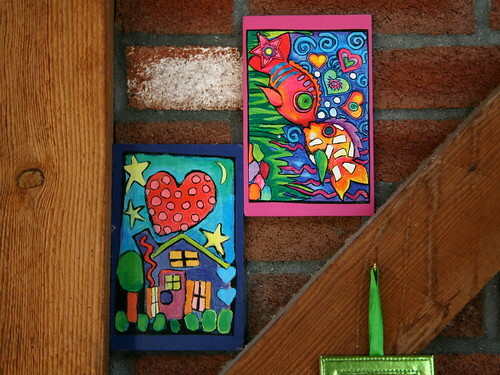 In one corner of our house, I tucked these wooden postcards inside a cross member of a post and beam. I purchased them on a business trip to southern California in 1995 before living in this house. 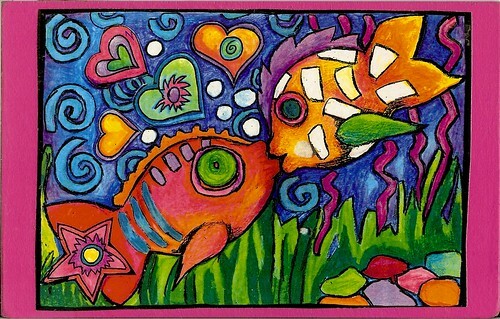 It was in the early days of dating with Doug so I mailed him the one with the kissing fish. With this ridiculous note on the back. 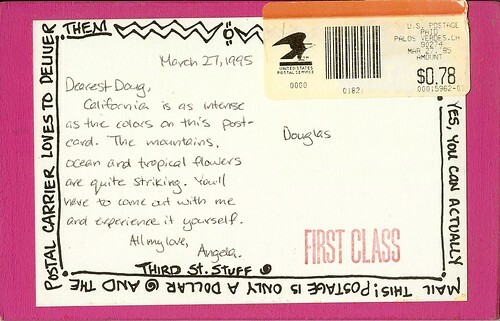 California is as intense as the colors in this postcard. The mountains, oceans and tropical flowers are quite striking. You'll have to come out with me and experience it yourself. OMG, I hate reading old love notes. How much time and thought did I put into that? When I mentioned that I gagged over this note to Doug, he replied, "You used to be crazy about me. Now, you're just crazy." No, no, I'm still crazy about Doug, but let's just show the fish side of the postcard. When he first received this card, he called it "Osculating Fish" and the name stuck. About a year this note, I did take Doug out to California, to my old stomping grounds in the bay area. We spent a week experiencing everything that I could cram in. We attended a wedding of my close friend at a winery, where I caught the bouquet. Then we headed west to Lake Tahoe to go skiing at my favorite resort, Alpine Meadows. Back in the heart of San Francisco, we had wonderful meals and visited the sights. And finally, we spent a day in Napa Valley, enjoying a couple's mud bath and wine tasting. Talk about a Type A vacation! Slow down! 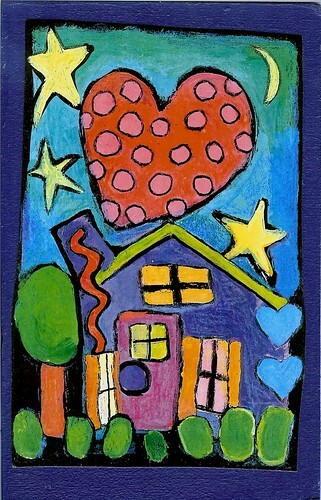 I bought the house postcard for myself because I knew that someday I would have a very fine house with lots of love (and two cats in the yard). I moved into this house in 1996 and Doug moved in two years later. Finally the postcards were united again. We put them together in the beams, but rarely stop to look at then anymore. I'm so glad that I took them down for a walk down memory lane. Such a sweet story! I really enjoyed reading this. Amazing postcards and you are right...the colors are intense. I was looking for blogs about Alpine Meadows to share on our site and I came across your post...If you're open to it, shoot me an email at jane(at)dwellable(dot)com.